↑ 1.0 1.1 1.2 1.3 1.4 1.5 1.6 1.7 1.8 1.9 "Risperidone". The American Society of Health-System Pharmacists. สืบค้นเมื่อ 2015-12-01. ↑ 2.0 2.1 2.2 2.3 Hamilton, Richart (2015). Tarascon Pocket Pharmacopoeia 2015 Deluxe Lab-Coat Edition. Jones & Bartlett Learning. pp. 434–435. ISBN 9781284057560. ↑ "Risperidone". International Drug Price Indicator Guide. สืบค้นเมื่อ 2015-12-02. ↑ "Respiridone". The American Society of Health-System Pharmacists. สืบค้นเมื่อ 2011-04-03. ↑ Kirino, E (2014). "Efficacy and tolerability of pharmacotherapy options for the treatment of irritability in autistic children". Clin Med Insights Pediatr. 8: 17–30. doi:10.4137/CMPed.S8304. PMC 4051788. PMID 24932108. ↑ 23.0 23.1 23.2 "www.janssenpharmaceuticalsinc.com" (PDF). ↑ Taylor, D; Carol, P; Shitij, K (2012). The Maudsley prescribing guidelines in psychiatry. West Sussex: Wiley-Blackwell. ISBN 978-0-470-97969-3. ↑ 30.0 30.1 30.2 30.3 "Risperdal Prescribing Information Label" (PDF). Drugs@FDA: FDA Approved Drug Products. Jannsen Pharmaceuticals, Inc. สืบค้นเมื่อ 2014-04-17. ↑ Smith, C.; Rahman, T.; Toohey, N.; Mazurkiewicz, J.; Herrick-Davis, K.; Teitler, M. (2006). 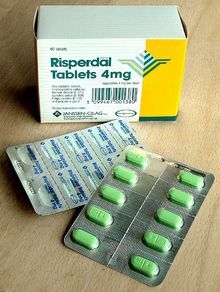 "Risperidone Irreversibly Binds to and Inactivates the h5-HT7 Serotonin Receptor". Molecular Pharmacology. 70 (4): 1264–1270. doi:10.1124/mol.106.024612. ISSN 0026-895X. PMID 16870886. ↑ "FDA approves the first drug to treat irritability associated with autism, Risperdal" (Press release). FDA. 2006-10-06. สืบค้นเมื่อ 2009-08-14. ↑ Scahill, L (2008). "How do I decide whether or not to use medication for my child with autism? should I try behavior therapy first?". J Autism Dev Disord. 38 (6): 1197–8. doi:10.1007/s10803-008-0573-7. PMID 18463973. ↑ "Companies belittled risks of Risperdal, slapped with huge fine". Los Angeles Times. 2012-04-11. ↑ "Arkansas Court Reverses $1.2 Billion Judgment Against Johnson & Johnson". NY Times. 2014-03-21. ↑ "Johnson & Johnson to Pay More Than $2.2 Billion to Resolve Criminal and Civil Investigations | OPA | Department of Justice". Department of Justice. 2013-11-04. ↑ "NY AG: Janssen pays $181M over drug marketing". The Seattle Times. 2012-08-30. หน้านี้แก้ไขล่าสุดเมื่อวันที่ 18 กันยายน 2560 เวลา 11:40 น.